Congrats goes out to the team of researchers: John Klein, Michael Stern, Giorgia Franchin, Markus Kayser1, Chikara Inamura, Shreya Dave, James C. Weaver, Peter Houk, Paolo Colombo, Maria Yang and Neri Oxman. This team has presented a working 3D transparent glass printing system! While we know of three other teams working in this exact idea, this teams successful results are amazing! Klein, John, Michael Stern, Giorgia Franchin, Markus Kayser, Chikara Inamura, Shreya Dave, James C. Weaver et al. 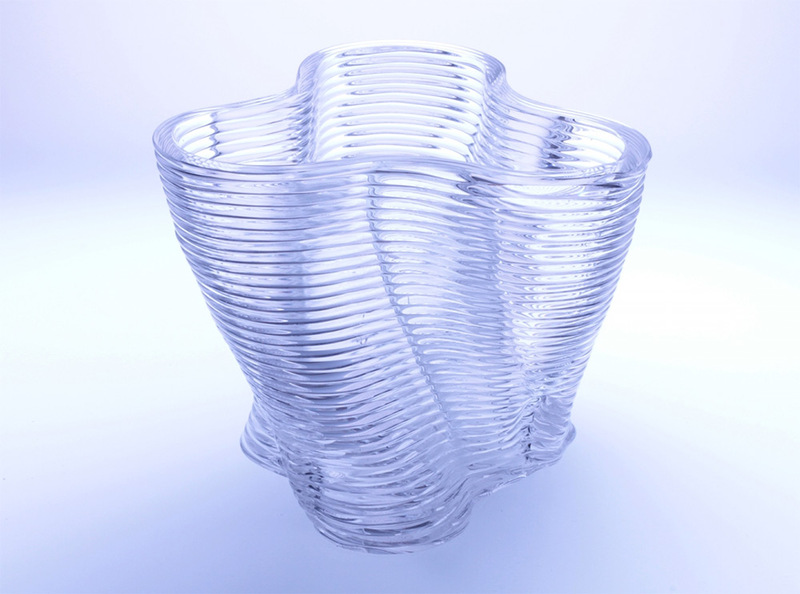 “Additive Manufacturing of Optically Transparent Glass.” 3D Printing and Additive Manufacturing (2015). comprised of scalable modular elements, able to operate at the high temperatures required to process glass from a molten state to an annealed product. We demonstrate a process enabling the construction of 3D parts as described by Computer Aided Design (CAD) models. Processing parameters such as temperature, which control glass viscosity, and flow rate, layer height and feed rate, can thus be adjusted to tailor printing to the desired component, its shape and its properties. We explored, defined and hard‐coded geometric constraints and coiling patterns as well as the integration of various colors into the current controllable process, contributing to a new design and manufacturing space. We report on performed characterization of the printed material executed to determine their morphological, mechanical and optical properties. Printed parts demonstrated strong adhesion between layers and satisfying optical clarity. Please check out other online pictures which are awesome. Again congratulations! 1 Comment on Congrats to G3DP team!